Today I’ll be showing you how to make easy Cookies n Creme stuffed pancakes! They’re quick, simple n delicious! Start by taking your pancake mix in a large bowl and following directions on box. Depending on how many you’re making, I use milk instead of water. Your pancakes come out thicker n fluffier. For every 2 cups pancake mix replace the water with One and a half scoop of milk. Mix until all lumps are gone and you have a thick batter. Next your will want to either put your mix in a ziplock for easier dispense or just straight up pour it in the pan from the bowl on medium to low heat if you nice like that. Place a bunch of your Hershey Cookies ‘n’ Creme Drops in the pancake and push them down. Now you have two options, pour more pancake mix over your drops or take your finger and push over some excess pancake mix to cover the drops. Then flip. • Repeat steps for additional pancakes. Dust with powder sugar, drench with syrup. Take the cookies’n’creme bar you have a smash into little pieces. Throw those on top of your stack and boom! There you have it. 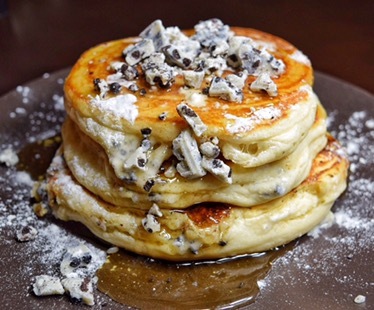 A Hershey’s Cookies’n’Creme pancake stack! Pretty easy right? Here’s a quick video to show you the steps! Previous postCookies n’ Creme Red Velvet Cookies! Next postBuffalo Mozzarella Chicken Rings!